After getting the fever Raghava continued to work; he has no source of income other than the Rs 200 per day he makes on plantations. But he took five days to do what he otherwise would accomplish in three days, even two. In Kerala, where labour is the most expensive in the country, that is an additional cost for the farmer. That's the chikungunya peculiarity its lingering debilitation takes away the victim's productivity and hits family incomes for weeks or months. Two mosquito species in India, Aedes aegypti and A albopictus, are known to spread the disease-causing virus. These mosquitoes breed in small collections of water, like in tree trunks, leaves (areca's are quite good), coconut shells, discarded cups. Had the mosquitoes been prevented from breeding, the family would not have gone through weeks of physical and financial pain. The question is what needed to be done to prevent mosquito breeding and who should have done it? The state government guidelines make the local government responsible for reducing mosquito breeding. In Padre, it would be the village panchayat. The community also needs to do its bit to keep the environment clean. "We cannot go to all households and remove water from all breeding places," says Vishwas Mehta, Kerala's health secretary. It is a great administrative challenge indeed, but not impossible. Across the Indian Ocean, the French territory of Reunion Islands, which in 2005 saw the first major chikungunya outbreak in three decades, has done it. The authorities there have developed an elaborate surveillance system, which gathers information on the mosquito density in every area. Such data when fed into scientific models can predict where the next outbreak might occur, giving citizens and government advance warning, critical to preventing an epidemic. Last year in July, the south-east Asia office of who suggested developing an early warning system for chikungunya based on gis (geographical information system), a technology that combines a set of data using a software to locate data points on a map. But India is yet to do anything about it. When Down To Earth (dte) contacted rmsi Pvt Ltd in Noida, National Capital Region, its senior manager M Irfan-Ullah said the technology was available. He even shared three maps predicting areas vulnerable to chikungunya outbreak. Results most parts of the country have suitable conditions for the disease to spread, with the Northeast, Orissa, Chhattisgarh, Andhra Pradesh and West Bengal particularly at risk. The Northeast is extremely vulnerable because of the prevalence of the prolific A albopictus, says V P Sharma, former director of the National Institute of Malaria Research, Delhi. 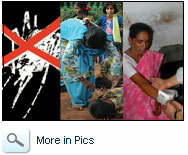 Some parts of Rajasthan, Jammu and Kashmir, Bihar, Haryana, Punjab and Uttar Pradesh appeared safer. When the map was shown to A Townsend Peterson, distinguished professor, ecology and evolutionary biology, Kansas University, us, who is an authority on modelling diseases, he suggested that modelling the vector along with the disease would give a better picture of chikungunya's advance in India. So Irfan made another attempt to model out the distribution of both the known vectors of the virus, A aegypti and A albopictus, using whatever little data was available. The projected scenario turned bleaker. Uttar Pradesh, Bihar and Jharkhand, earlier believed to be relatively safe, were at a higher risk. Although these maps are indicative, they are serious enough to prompt Shree Padre, a veteran journalist in Kasaragod, where 15,621 suspected cases of chikungunya were reported by July 8, to remark, "Unless the administration takes serious steps, the disease would cause much more damage." The first thing the administration can do is help improve the prediction model. "Lack of reliable data on the spread of different types of mosquitoes was a major limiting factor in building the model," says Irfan. Better maps can be made using information on the density of larvae, mosquitoes and the virus, says Sham Davande, a gis specialist at rmsi. Data on the vectors's ability to transmit the disease and the susceptibility of people in different parts of the country can help predict the spread of the disease in a community and even help pinpoint the time when an outbreak could become an epidemic. The country lacks the infrastructure and manpower to collect information on even the distribution of mosquitoes. 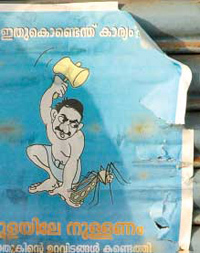 Take the example of Kerala where most of the districts, including Kasaragod, do not have an entomologist to monitor the mosquito breeding areas to see that their numbers do not cross the critical level. This year 24,479 suspected cases of chikungunya were reported in the state till September 10. Monitoring chikungunya is not just an administrative challenge. Virologists too will have to keep up with the virus that keeps mutating. At a regional committee meeting of who in the second week of September, a Maldives representative suggested revising the definition of chikungunya fever because the symptoms have changed. The Bhat family shows how. Though fever and pain in the wrist and ankle are common symptoms, some also get body rashes or their nose and ears turn black. Some vomit or get loose motions. Mouth ulcers, giddiness, itching, scaling of the skin are also observed. The delegation's recommendation was taken seriously unlike that of Mohanakumar Y S, a doctor in Kasaragod, who has been writing to the district authorities and the Indian Medical Association about it. Mohanakumar has treated about 3,000 patients since March and observed symptoms one does not find in awareness literature on chikungunya. "People are getting affected more than once; children are also suffering. New symptoms like conjunctivitis, mouth ulcers and skin rashes are common and continue for long," he says. Could this be another disease? Has the disease changed its form? The authorities are yet to answer his questions though evidence is available; several studies across India have reported changing symptoms (see Read the signs). These changes have made diagnosis difficult. "Four samples we sent to the National Institute of Virology (niv), Pune, last year were negative as are the three we sent this year," reveals a doctor at a primary health centre in Karnataka's Dakshin Kannada district. Already all kinds of fever during an outbreak get dubbed chikungunya because niv, is the only lab in the country with the authority to confirm chikungunya. This shows that we know very little about the disease. It is changing in more ways than one. It is said that once a person is affected by the virus, she or he becomes immune. Mohanakumar has seen this is no longer the case; his patients get affected again and again. Celinamma Joseph, medical officer, community health centre, Nileshwar block, Kasaragod, says it is true. Saraswati of Mulakkalu village in Kasaragod is one of those who have had a relapse. Avinash, Kerala. The 18-year-old is a victim of degraded environment for the second time. Seven years ago, a DTE reporter had visited him in Vaninagar to find out if his cerebral palsy and epilepsy could be linked with the use of endosulfan in the area. This time, Avinash, who cannot speak, caught chikungunya. His mother Shaileja realised that something was wrong when he stopped crawling. His joints were swollen; he had fever and did not let her touch him. Avinash's father expired a few years ago and Shaileja is unable to roll bidis since she has also caught the infection. Ishwar Bhat, Karnataka. People in Mani village in Bantwal taluk of Dakshin Kannada district complain their phones are not working. The reason three of the five BSNL linemen have contracted chikungunya. 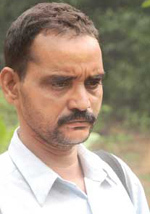 Ishwar Bhat, 48, senior telephone operator assistant, is one of them. The place has overhead lines and it was impossible for the linemen to climb up the poles to correct the faults. 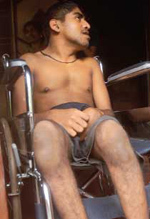 On the evening of May 30, Bhat's wrists started hurting. When he woke up the next day, he could barely open his fingers. For two days, he moved around the house on all fours. He had to tie a rope in the toilet for support. Fever and rashes were nothing compared to the pain. The government claims the disease does not lead to death. Doctors in Kasaragod do not agree. A study by the Indian Institute of Management, Ahmedabad, backs their observation. Researchers from the institute studied the 2006 epidemic in Ahmedabad, where 60,777 people were affected by chikungunya. They compared the mortality rates in Ahmedabad from 2002 to 2006. The team found 2,944 excess deaths had occurred during August-November in 2006--the period when the virus struck Ahmedabad--compared with the average number of deaths during the same months in earlier years. The study was published in the March 2008 issue of journal Emerging Infectious Diseases. "We need to follow up the patients to figure out the long-term effect of the disease. We are doing this through post cards and by seeing the patients, but the results are yet to come," says Rajan J Payyappilly, director, Kerala State Institute of Viral and Infectious Diseases. It is also important to know where the virus survives between epidemics. "It's pretty simple. You just have to analyse the blood in mosquitoes' stomachs and figure out what else it bites," says P K Das, former director of vcrc. Similar studies in South Africa and the Philippines have shown that primates could be harbouring the virus. There are gaps in our knowledge of the vector as well. N Pradeep Kumar, in charge of the vcrc unit in Kottayam, points out that there could be more than one vector. vcrc is studying another mosquito, Mansonia, to see if it could be the vector in Kerala. Mansonia is known to transmit the disease in other parts of the world. Some initiatives are on in Kerala to tackle the challenge. vcrc set up a lab in Kottayam in June, which is monitoring mosquitoes for the presence of the chikungunya-causing virus. niv too has set up a unit in Alappuzha for timely identification of the fever cases. At the who meeting, delegates discussed training entomologists in Southeast Asia.